What can you expect from CJS Heating & Air? We offer same day service in most cases, and always call ahead before your CJS technician arrives… so no more waiting around for service! You’ll know the detailed price BEFORE we start the work. Straight Forward Pricing means no surprises, no hidden fees, no gimmicks. The price you agree to is the price you pay—even if more work is needed to complete what’s quoted. 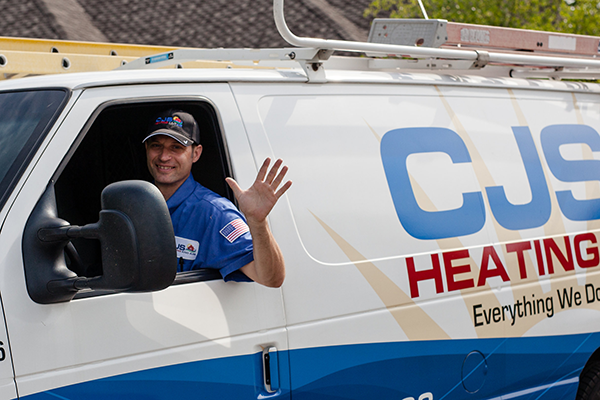 Before wearing a CJS Heating & Air Conditioning uniform, our techs are screened, background checked, tested and trained for your safety and peace of mind. That’s how they earn so many 5-star customer reviews. We’re not finished until you’re completely satisfied—and that’s just for starters. Read all the guarantees you get from CJS. Regular maintenance helps keep your heating and cooling system operating as close to factory-fresh standards as humanly possible. Our heating and air conditioning technicians serving Dayton, Bellefontaine, Marion, Mount Vernon, and Zanesville provide comprehensive care based on our on-going training and the experience that comes from taking care of thousands of homes in the Dayton area. From annual precision AC tune-ups and repairs to new system installations, every tech works every day to demonstrate how everything we do is all about you.